The entire scenario of the seven last plagues of chapter 16 is called the “third woe” (Revelation 11:14) also the “seventh [trumpet bearing] angel” in Revelation 11: 15. Chapter 16, verses 17 to 21, ends with the “seventh [plague bearing] angel” pouring out his “vial (or ‘bowl’) into the air” causing the cataclysmic events of the seventh plague. Since “every island [had] fled away and the mountains were not found” (Revelation 16:20), it is obvious the last plague will have reconfigured the topography of the earth most dramatically making it nearly unrecognizable. If the next scenario were not the second coming, the few survivors would have little or nothing to allow for survival. The last vestige of the “threefold union” depicted as the “great city” (Rev.16:19) and “the “three . . . frogs” (Rev.16:13), will no longer exist. Therefore, at the very end of the “third woe” or the last of the “seven last plagues” of chapter 16, we must conclude that the next event is depicted in chapter 6! That is when “heaven departed as a scroll when itis rolled together; and every mountain and island were moved out of their places. And the kings of the earth, and the great men, and the rich men, and the chief captains, and the mighty men, and every bondman, and every free man, hid themselves in the dens and in the rocks of the mountains; And said to the mountains and rocks, Fall on us, and hide us from the face of him that sitteth on the throne, and from the wrath of the Lamb: For the great day of his wrath [had finally] come . . .” (Revelation 6:14-17). Thus, we are compelled to conclude that the last part of chapter six depicts the great consummation, the concluding episode of the seven last plagues of chapter 16. Also, we may identify the seventh plague as the transition point between the plagues and the second coming in spite of its long, retrospective reach backward from chapter 16 back to chapter 6! That will bring the premillennial executive judgment, depicted event-by-event in the seven trumpet scenario (beginning in Rev.8:7), to its conclusion. 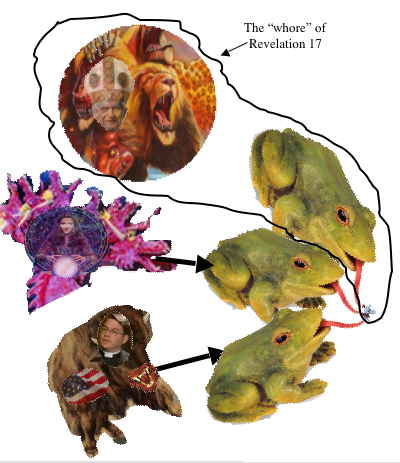 Even though we might expect this chapter to looking further into the subject of the plagues or the second coming, John, in this chapter, now takes us backwards in time to a retrospective look into the history of one the three members of the frog scenario depicted in Revelation 16:13-16 which was also retrospective to the the seven last plagues listed in verses 1-12 and 17-21. Therefore, although this chapter is a disconnect from chapter 16, it is a repeat of John’s style of writing that we have already encountered between chapters 9 and 10; then 11 and 12; then 12 and 13; then 14 and 15. Then, once again, while the end of this chapter will bring us to a point ending in post probationary time, chapter 17 will begin in probationary time previous to the time when Jesus “took the censer, and filled it with fire of the altar, and cast it into the earth” (Rev.8:5). 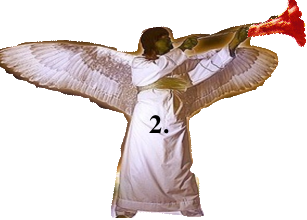 The Commentary agrees, saying that “the identification of this angel as one of the seven plague-bearing angels of chs.15 and 16 implies that the information about to be imparted to John is related to the seven last plagues. This relationship is confirmed by the fact that the announced topic of this chapter—‘the judgment of the great whore’—takes place under the seventh plague” when “the great city was divided . . . and great Babylon came in remembrance before God, to give unto her the cup of the wine of the fierceness of [God’s] wrath” (Revelation 16:19). But, there is a difficulty with that understanding. Note that while “the great city was [being] divided . . . great Babylon [only] came in remembrance before God” suggesting her “judgment” had already come. We will explore that “difficulty” later on in this chapter. Another point to consider is this same plague-bearing angel is also seen carrying John “away in the spirit to a great and high mountain, and shewed [him]that great city, the holy Jerusalem, descending out of heaven from God” (Rev.21:9,10). That will occur at least a thousand years after the seven last plagues will have been poured out! Therefore, we should not assume that this “angel” is necessarily going to tell us something that happened to the “great whore” during the seven last plagues even though it seems logical. Since it is generally recognized that a “woman” (such as in chapter 12) in Bible prophecy represents a church, it is reasonable to assume “the great whore” represents a church that was once loyal to her husband Christ, but has since wandered away and became one of the metaphoric “frogs” depicted in chapter 16 that comes “out of the mouth of the beast” (Rev.16:13). “That woman Jezebel,” depicted in Revelation 2:20 might seem a good application because she called “herself a prophetess.” But she taught God’s “servants to commit fornication, and to eat things sacrificed unto idols” and never had any use for Jehovah. Although exceedingly sinful, she never made a false profession. In other words, she was pagan from start to finish! So, she was not really an apostate like the “whore,” but was pagan throughout her life. She was a prostitute in the literal sense rather than the spiritual sense because she “. . . served Baal, and worshipped him” (1 Kings 16:31) and never served Jehovah. Therefore, she was not a hypocrite. Anybody who had “ears to hear and eyes to see” knew she was a pagan which coincides with the “pale horse” of the fourth seal (Revelation 6:8). The “whore” of Revelation 17, on the other hand, is apostate in the figurative sense because she was once loyal at the beginning of the Christian church, making the “horse that was red” (Rev.6:4), a more fitting symbol. The fact that the “great whore” is sitting “upon many waters” (see verse 15) suggests she has “direct control of men as individuals, religiously, and here as directing the policies of civil government. It has ever been characteristic of apostate Christianity to attempt a union of church and state, in order to consolidate religious control over public policy.” Therefore, the “great whore” represents a hypocritical church that once believed but fell away. Such a concept parallels what could be considered spiritual prostitution. 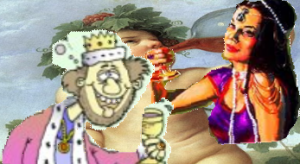 Note the similarity of this verse to Revelation 18:3 where “all nations have drunk of the wine of the wrath of her fornication, and the kings of the earth have committed fornication with her . . .” “Fornication,” in the spiritual sense, represents (among other things) the combining of church and state. It results in an unlawful relationship with “the kings . . . and inhabitants of the earth” who are blinded to the corruptness of her character. They are blinded to the extent that they actually deifie her! This is spiritual confusion, well illustrated with the condition of drunkenness. Likewise, the “great whore” receives a mortal wound in verse 16 of this chapter. But, but, since it is not healed we must conclude it is future just as the “vile person” of Dan.11:21, 45 who “shall come to his end, and none shall help him.” Therefore, chapter 13 depicts the “sea beast’s” career from 538 A.D. and on into the future after it has regained the lost power it had during the dark ages. Likewise, the “great whore” represents the same career from the healing of the organization’s deadly wound to its final demise. Therefore, the woman in this chapter, in contrast to the fearsome “beast” of chapter 13, is depicted as an attractive female in order to help us better understand how it is able to seduce and intoxicate the “the kings of the earth . . . and the inhabitants of the [whole] earth” during the coming future dark age. The pronoun “he” refers to the plague-bearing angel of verse 1 who, later on, also carried John “away in the spirit to a great and high mountain” (Revelation 21:9, 10). Here he carries him “into the wilderness” “an uninhabited region where life could be sustained only amid difficulty and danger.” Why would the angel carry him into such a place? Note, “the wilderness” is where the good “woman” of chapter 12 “fled” during the dark age of history (Revelation 12:6). Later, she actually had to “fly” there “from” the “face” (the actual presence) of “the devil” when he realized “he [had] but a short time.” There, she was “nourished for a time, and times, and half a time” during the future dark age (see Revelation 12:12-17). This accounts for John’s being “carried . . . away . . . into the wilderness” at this time. He was being shown some important details about the future dark age that will nerve God’s people to face the future with strong confidence in God’s word and His providence. As we look back into Christian history, represented by the story of the good woman of chapter 12 who was obliged to seek refuge in the wilderness twice , it should be apparent that chapter 17 deals explicitly with details concerning the second (or future) period of the woman’s experience as a fugitive. Both experiences bypass the things she suffered at the hands of pagan Rome at the very beginning of her history. Those experiences occurred during the time of the “legs of iron” (Dan.2:33,40) and during the time of the “fourth beast” (Dan.7:7). 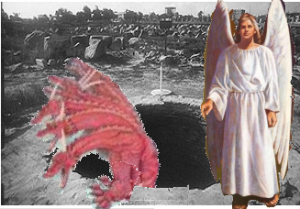 Brief mention is also given to it in Rev.12:4 when the dragon “stood before the woman . . . for to devour her child as soon as it was born.” The last two fugitive experiences take place after the transition from the “legs of iron” to the “feet of iron and of clay” (Dan.2:33). Additionally, the “scarlet coloured beast” has the same color as “the horse that was red” (Rev.6:4)! While its vicious rider certainly visualizes diabolic characteristics, the color of the horse certainly equates with that of the rider. John’s angelic host will later explain the meaning of the beast’s “seven heads and ten horns,” the same heads and horns situated on the “great red dragon” (Rev.12:3). Even though no “crowns” are depicted on this beast’s seven heads, note in verse 10 that its heads are said to be “kings” which “crowns” represent. The manner and dress of this “woman,” with “colors of royalty, to which this ‘woman’ laid claim,” is similar to the “vile person” called a “king [who] shall do according to his will; and he shall exalt himself and magnify himself above every god, and shall speak marvelous things against the God of gods, and shall prosper till the indignation be accomplished” (Daniel 11:21, 36). Note that while “purple, and scarlet” are often mentioned in Exodus 25, 26, 27, 28, 35, 36, 28, 39, another color, “blue” is missing on the the woman’s dress suggesting the absence of God’s law in her mind and heart. With her “golden cup [being] full of abominations and filthiness” suggests that her final judgment is about to be pronounced. Then is when “God [will] give unto her [‘great city’] the cup of the wine of the fierceness of his wrath” (Revelation 16:19). This parallels the “horn” power whose “body [was] destroyed, and given to the burning flame” (Daniel 7:11), or the “king of fierce countenance” who “shall be broken without hand” (Daniel 8:23, 25) or the “vile person” who “shall come to his end, and none shall help him” (Daniel 11:21, 45). She is also “the mother of harlots.” Mrs. White “saw . . . that the mother was not the daughters, but separate and distinct from them. . . . and her daughters, the Protestant sects, were the next to come on the stage and act out the same mind that the mother had when she persecuted the saints. I saw that as the mother has been declining in power, the daughters had been growing, and soon they will exercise the power once exercised by the mother.”  In other words, the daughter harlots are parallel to the “earth beast” (Revelation 13:11) and “them that forsake the holy covenant” when they begin to dialogue with the “vile person” (Daniel 11:21, 30) one of the evil woman’s parallels in the book of Daniel that represents papal Rome. Therefore, although the “woman” represents the papal Rome organization that came to ruin in 1798, her harlot daughters did not exist prior to 1798. Protestantism, during the Dark Ages prior to 1798, was not apostate. It was only sometime after 1798 that its apostate features began to emerge. Consider Rev.14:8 where the warning: “Babylon is fallen, is fallen, that great city . . .” suggesting an incremental spiritual degradation of the Protestant church’s former innocence and purity and becoming more and more like papal Rome. Without that degradation or apostasy, it would be impossible for the woman’s (or earth beast’s) “deadly wound” (Rev.13:3) to heal, and she could never have become a “Mother!” But, because this woman is called “THE MOTHER,” the least we can say is that this “woman” represents the post-1798 characteristics of papal Rome. 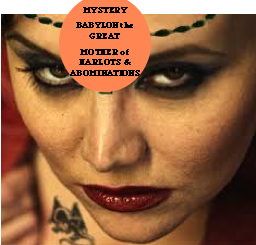 But, she is not only “the mother of harlots,” she is also “the mother of . . . abominations of the earth”! In other words, she is the originator of the “abominations of the earth.” They are referred to in verse 4 as a multiplicity of detestable things filling “a golden cup in her hand” inclusive of such false doctrines as the immortality of the soul and eternal torment. She has successfully (for the most part) reintroduced a human priesthood to act as intercessor between man and God. Such a priesthood was abolished back in 31 AD when Christ died on the cross and, at the same time, “the vail of the temple was rent in twain from the top to the bottom” (Matt.27:51) signifying the end of human intercession between God and man and the beginning of Christ’s heavenly priesthood to whom we can freely go to seek His intercession. What an abomination it is to go to another fallen man to seek forgiveness such as at the confessional! Her major abomination that is embraced almost be the whole world, is the substitution of the first day of the week for the seventh day Sabbath. In fact, it is the “mark” of her authority (see: “A Doctrinal Catechism” by Stephen Keenan). This abomination is spoken of by Daniel as “the abomination that maketh desolate” (Daniel 11:31; 12:11). Jesus referred to “the abomination of desolation, spoken of by Daniel the prophet, standing where it ought not . . . then let them that be in Judaea flee to the mountains” (Mark 13:14) which the Christians did in 70 A.D. But “The time is not far distant, when, like the early disciples, we shall be forced to seek a refuge in desolate and solitary places. As the siege of Jerusalem by the Roman armies was the signal for flight to the Judean Christians, so the assumption of power on the part of our nation [the United States] in the decree enforcing the papal sabbath will be a warning to us. It will then be time to leave the large cities, preparatory to leaving the smaller ones for retired homes in secluded places among the mountains” which coincides with the “wilderness” John mentions in verse 3. “The first day of the week is to be exalted and presented to all for observance. Shall we be partakers of this cup of abomination?” That will be the abomination of all other “abominations,” for it will eventually, cause to Jesus’ leave the “temple in heaven” desolate after which “no man [will be] able to enter” (Revelation 15:8), and ultimately bring physical desolation on the earth during the millennium “at the end of the war [when] desolations are determined” (Daniel 9:26). Bear in mind this “woman” represents a post 1798 papal scenario. She could not be “the mother of harlots” (verse 5) prior to that time because apostate protestantism did not exist as a movement during the dark ages. 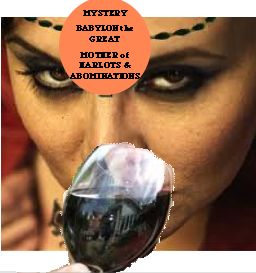 Therefore, we have yet to see her “drunken with the blood of the saints” like she was during the historic Dark Age. The primary factor delaying her full recovery as a “mother,” is the slow, incremental return of her daughter “harlots” to her. John doesn’t tell us who those “fellowservants” and “brethren” are at that point. But, later in his vision he “saw the souls of them that were beheaded for the witness of Jesus, and for the word of God, and which had not worshipped the beast, neither his image, neither had received his mark upon their foreheads, or in their hands” (Revelation 20:4). Since those “souls,” the “fellowervants” and “brethren”of the historical martyrs, refuse to accept the “image” and “mark” that are yet to be set up, their martyrdom (to be “beheaded”) has yet to take place. Therefore, we must conclude that the judgment has not yet passed to the living. But, when it does pass to the living, the “mother” will become “drunken with the blood of the saints, and with the blood of the martyrs of Jesus.” Note that John says nothing about her daughters even though they will be responsible for her full recovery. Still, God places the greatest blame on the “mother” because, even though God has been giving “her space to repent of her fornication” for more than 200 years by now, she, like “that woman Jezebel,” has “repented not” (Revelation 2:20, 21). But, we question why John “wondered” about her “with great admiration” instead of great disgust! This is a warning to us. If even John “wondered with great admiration,” it is certain we too can be affected in the same way. So, even John, was apparently taken by her and nearly overwhelmed with admiration. That should put us on our guard realizing we too could be easily overcome with “admiration.” All who love God will find themselves struggling with the power of emotion against the power of reason based on the word of God. We can be certain her charm will escalate as we near the end of time! With that, the angel proceeds to expose the “mystery” or “secret” that John saw “written” on her “forehead” in verse 5. Coupled with that, he also promises to expose the “mystery . . . of the” “scarlet coloured beast” that the “woman” was sitting upon in verse 3. But, note here that the “beast” is shown carrying her. While verse 3 suggests that the woman controls the “beast” like the “waters” in verse 1, this verse reveals that the “beast” actually controls the woman! Consider the parallel of this relationship. 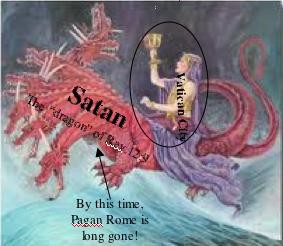 Note that the sea beast of Rev.13:2 receives its “power” and “seat” and “great authority” from “the dragon!” That reinforces our impression that the “scarlet coloured beast” of this chapter is the same creature as the “great red dragon” of Rev.12:3, especially since it has the same number of heads and horns! Thus, it becomes clear that the woman’s judgment is the result of her extraordinarily intimate relationship with the “scarlet coloured beast.” Little wonder, then, that the angel focuses on the characteristics of the beast rather than the woman, although we will find some details that relate to both the beast and the woman. 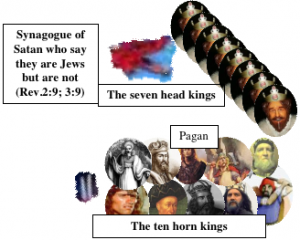 Interestingly, while “ten horns” are spoken of in Daniel 7:7, 20 and 24, nothing is said there about “seven heads.” That the “ten horns” of Rev.12:3; 13:1 and 17:1, 3, 7, 12 and 13 are often considered parallel to the horns of Daniel 7, we will discover certain difficulties with that view as we cover the succeeding verses in this chapter. So, what is the relationship of the “ten horns” of Rev.12, 13 and 17 to the “ten horns” of Daniel 7? The “beast” that John saw, was obviously the “scarlet coloured beast” of verse 3, but things are not so obvious when the angel gives the beast a strange name repeated again in verse 11: “was, and is not.” At the end of this verse, the entire name given is: “was, and is not, and yet is.” According to the Commentary, the “yet is” portion of the name could be read: “is to be” or “is to come.” [29a] It also observes “Was, and is not” indicates that: “At some time in the past the beast had been active, but then disappeared.” [29b] Then, according to the first part of the verse, he “is to come” sometime after he ascends “out of the bottomless pit.” After that he goes “into perdition.” Those who find themselves lost in “wonder” [29c] at these beastly activities, will be like John in verses 6 and 7 when he marveled at the woman. They (not inclusive of John) will not be found “written in the book of life!” So, this is a very serious matter! “Wonder” either of the “beast” or the “woman” suggests that the angel is attempting to relay a message of vital importance to God’s people. Compare this name with the name of Christ in Revelation 1:4, 8: “which is, and which was, and which is to come, . . .” suggesting on-going, never ending existence and openness in contrast to the “beast” who, in his agenda, depends on secrecy and darkness. This is the fifth time the term “bottomless pit” is used. We see it in Rev.9:1, 2, 11; 11:7 where its “key” was given to “Abaddon” or “Apollon” in context with the fifth trumpet or first “woe.” From those scriptures, we also learned that the “bottomless pit” scenario is post-probationary in nature. Consequently, this “beast” will “ascend” or come out of hiding and reveal himself for what he is sometime after Jesus has “cast” the “censer . . . into the earth” (Rev.:5) . Those overwhelmed by his appearance and who are “not written in the book of life” will obviously “go into perdition” with him. 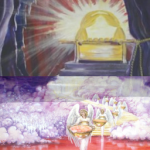 This understanding in reinforced in Rev.11:7, where after the “two witnesses” had “finished their testimony, the [same] beast” ascended “out of the bottomless pit.” That must be when it becomes “yet is,” in other words: when it materializes or becomes visual. So, the stakes are extremely high. “If he should effect his escape, Israel would lose their lives.” But, “Israel” does not represent those “that dwell on the earth.” They, by faith, “dwell in heaven” (Revelation 13:6). Consequently, their “names” are “written in the book of life from the foundation of the world.” They are fully aware of who the “beast” really is “when they (actually) behold” it because they have read, heard and have kept these prophecies (see Revelation 1:2) which will equip them to resist the “scarlet coloured beast” in the form of Wormwood and Abbadon. Having learned that the “beast” controls the “woman” and that it comes “out of the bottomless pit” and reveals himself during post probationary time in verses 7 and 8, the injunction that only a “mind which hath wisdom” suggests the following to be even more perplexing. This is much like Rev.13:18 where “wisdom” is required to understand the perplexing “number” 666 of “a man.” Having asked God for “wisdom,” lets make the attempt to understand what Gabriel is trying to tell us. 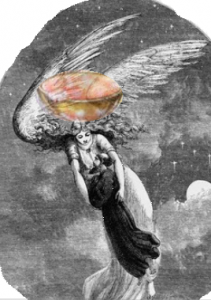 So, after the brief sketch of the “was, is not, yet is” career of the “scarlet coloured beast,” the angel now prepares to flesh out some details about it by helping us to understand the literal meanings of the other figurative terms in verses 9 to 13. Evidently, only the “mind which hath wisdom” could be able to grasp these things. It is the same quality of mind required to understand “the number of the [sea] beast . . . Six hundred threescore and six” which is “the number of a man” (Revelation 13:18). But, that “beast” rose “up out of the sea,” while this ascended “out of the bottomless pit.” In fact, the “pit beast” gave the “sea beast” its “power, and his seat, and great authority” (Revelation 13:2) and the “earth beast” begins to speak like the “pit beast” (verse 11)! 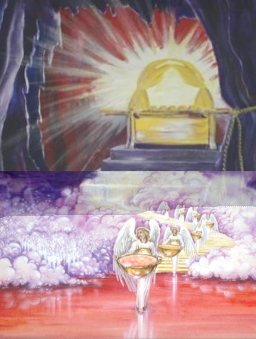 The angel then declares that “the woman” is seated on “seven mountains” represented by the pit beast’s “seven heads.” Therefore, those “seven mountains” must comprise the “seat” given the “sea beast” by the “dragon” in Revelation 13:2, the literal “seat of the woman” in Rome. Interestingly, according to World Book Dictionary, the name “Vatican” is is defined as “the collection of building grouped about the palace of the pope, built on the Vatican Hill in Rome” with “Vatican” meaning “hill, one of the hills in ancient Rome . . .” (note this illustration is a map of the actual “seven mountains” in Rome). Consequently, the “sea beast” of Revelation 13:1-10 represents the Roman Catholic system as a whole, while the “woman” must represent its headquarters in Rome, namely Vatican City (see illustration under verse 7). The first phrase is critical. 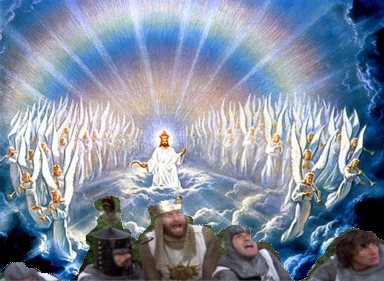 The alternative wording to “And there are,” is: “And seven kings are they.” Therefore, we must consider a dual application to the “seven mountains.” Not only do they represent the “seat of the beast” in Rome, but “seven [specific, literal] kings.” The most logical, and nearly overpowering conclusion is that they are also “seven kings” who rule in Rome with the “kings” being popes! But, this is where we collide with a figurative “brick wall.” Since 583 AD nearly 200 popes have reigned in the Vatican. But, because the “woman” became “the mother of harlots” sometime after 1798, the number can be narrowed down to some fifteen popes including the present who, at the time of this writing, is Pope Benedict XVI. So, by this time since 1798, fourteen instead of five popes have fallen! Therefore, the “one [that] is” remains to be seen. Until it becomes evident which is the first of the five popes who have “fallen” is, it will be futile to attempt identifying who the “one” that “is” is! Therefore, like most of the prophecies which predict future events, their fulfillments have always enabled us to correctly interpret them retrospectively. We can never be certain about possible interpretations prospectively. Evidently, that is true of these five, fallen “kings” because, the starting point can only be established after the “eighth,” alluded to in the next verse, begins his reign. This is probably one of the most startling prophecies in the Bible! Obviously, this is the “beast” that ascended “out of the bottomless pit, and go[es] into perdition” in verse 8 that represents Satan. It follows, therefore, that the saints, being fully aware of who Wormwood is, will then know with certainty who the previous seven popes were. Up to that time, it will only be speculation. Obviously, the anticipation of who is the “eighth” is will become acute when the second trumpet (Revelation 8:8,9) scenario begins. Bear in mind, most if not all the “five” will probably fall during probationary time, perhaps the sixth, the “the one [that] is” will be alive during the “short space” transpiring between probationary and post probationary time up to the sounding of the second trumpet. Remember, the trumpets sound only after Jesus casts the “censer . . . into the earth” in Revelation 8:5. But, where does “Abaddon or Apollyon” (Rev.9:11) fit into this scenario? The next two verses offer some clues. The later view seems far more reasonable. All of those “various nations” lasted far longer than “one hour.” As a matter of fact, the “feet of iron and clay,” (Daniel 2:33 34, 41, 41) beginning with “the breakup of the Roman Empire” in 476 A.D. to the tip of the toes represent more than 1500 years at this point in time! Although many consider the “toes” of the great image to be parallel to these “ten horns,” Daniel does not number the toes. Therefore, it is shaky ground to consider the toes to be representative of these ten kings. Daniel’s “ten horns” which are also “ten kings” (Daniel 7:7, 20, and 24) are a more logical selection. But, three of them were “plucked up by the roots” (Daniel 7:8; 24) when the “little horn” parallel to the “woman,” made its appearance. That leaves a balance of only seven horns. 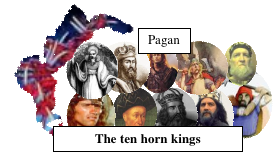 Nevertheless, those “ten horns” represented pagan nations, and these “ten horns” which “are [also] ten kings” are very likely “ten [pagan] kings” because they “hate the [papal] whore” (see verse 16). It also stands to reason that they may be rulers appointed by the heathen “Gentiles” (Revelation 11:2) who will soon fall under the deceptive power of Abaddon, or Apollyon. “Some have taken the ‘one hour’ . . . as prophetic time, according to which it would represent a period of about two weeks of literal time. However, the context seems to imply otherwise. . . it seems preferable to take the expression ‘one hour . . . as indicating a brief but unspecified period ‘time’”. But, again, that should not seem strange, because, as we have noted before in Revelation 8:10, 11 and Revelation 9:1, 11 where John saw two fallen stars, Satan leads a double life, presenting himself to some as an angel of light (2 Corinthians 11:14), and to others who have an alternative view of god, as a powerful “macho” being. But, he has a far more sinister purpose in this final instigation of man against man. In it, as we have seen, “Men will be deceived and will exalt him to the place of God, and deify him. . .” as, according to John’s vision, Wormwood and/ or Abaddon to begin with. Ultimately (see Rev.11:13), it will be Abaddon alone after Satan abandons his “christian” disguise as Wormwood. At first glance, the pronoun “these” refer to the “ten kings” of verse 12. But “these” could also be inclusive of the “seven heads” of verse 9 as well as the “ten horns” except that the “heads” are sequential (one being followed by another) while all ten of the ten horns are contemporaneous (all reigning at the same time) with each other. 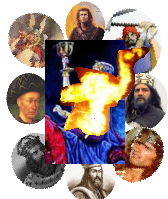 Nevertheless, each “head” king (as well as the “ten kings”) all give “their power and strength unto the beast” while they lived. Consider this statement: “’These have one mind.’ There will be a universal bond of union, one great harmony, a confederacy of Satan’s forces. ‘And shall give their power and strength unto the beast.’” Note that this reference quotes all the words of verse 13, but adds a comment between “one mind” and “and shall give…” The comment primarily pertains to “These,” the first word of this verse. They become an “universal union” all completely in “harmony” called “a confederacy” of the “forces” of Satan (the scarlet coloured beast) that carries the woman! making it difficult, if not impossible to exclude the seven head kings. Again, while this reference quotes all the words of verse 13, the inserted sentence between “mind” and “and shall” referring to “a universal bond of union” and “one great harmony” making up “a confederacy of Satan’s forces” which must be inclusive of the “seven heads” of verses 9 to 11 because the “ten horns” only last “one hour” while the “seven heads” exist a good deal longer. Note again that the “seven heads” as well as the “ten horns” are a part of the “beast,” not the “woman.” Therefore they all “give their power and strength unto the beast.” They assist and support the “woman” only so long as it suits the purpose of the “beast” who will become the “eighth,” the last of the “seven.” Verse 16 tells us what happens to the “woman” when that power transfer takes place. The pronoun “these” is seen also in verse 13. While it obviously refers to “the ten horns” and the “seven heads,” the “woman” who was “drunken with the blood of the saints, and . . . the martyrs of Jesus” must also be included. The “beast” that “carrieth her” (verse 7), in addition to its “seven heads” and “ten horns,” is the dominate figure who energizes and inspires its human agents represented by those symbols. The Lamb’s human agents are “they that are with him” the “called, and chosen, and faithful.” “The so-called Christian world is to be the theater of great and decisive actions. Men in authority will enact laws controlling the conscience, after the example of the papacy. Babylon will make all nations drink of the wine of the wrath of her fornication. Every nation will be involved. Of this time John the Revelator declares : [Rev. 18:3-7, quoted]. ‘These have one mind, and shall give their power and strength unto the beast. These shall make war with the Lamb, and the Lamb shall overcome them: for He is Lord of lords, and King of kings: and they that are with Him are called, and chosen, and faithful’ [Rev. 17:13, 14].” In that case, the “woman, seven heads” and the “ten horns” represent “every nation” that will confront the Lamb and “they that are with him . . .” during the final moments of earth’s history. This verse takes us back to verse 1 where “the great whore” is seen sitting “upon many waters.” While this portrays the “woman” dominating “peoples, and multitudes, and nations, and tongues,” she, according to verses 9 and 10, also dominates the “seven kings” represented by “seven mountains” where “the woman sitteth.” And, according to verse 3, we see her “sit upon a scarlet coloured beast.” But, according to verse 7, that same “beast . . . carrieth her” indicating its control over her. This symbolic ambiguity is intentional, showing that while she appears to oppose Satan, in reality, he controls her, and through her, wields control of the “peoples, and multitudes, and nations, and tongues” under her control. But, how much control does she have over the ten horn “kings” who “receive power as kings” for only “one hour with the beast” not the “woman” as we discussed in verse 12? Note what the ten horns do to the woman in the next verse! But, according to verse 12, the “receive power as kings” for only “one hour…” suggesting a rapid, even a spontaneous, unplanned movement to unseat the woman. So, it is unlikely they had a change of attitude and had really hated her right from the start. Note again in verse 13 that they gave “their power and strength unto the beast,” not the woman. It is legitimate to assume those from whom the horns had received their ”power as kings” had planned (even before giving them “power as kings”), right from the start, to “burn her with fire.” Consequently, an historic application seems very unlikely. Furthermore, it will have to happen before “Christ overcomes them” as noted in verse 14. When that happens, the “ten horn” kings, as well as any other nation in existence at that time, will be completely immobilized as we saw in Revelation 16:12. Additionally, “the woman” will have previously been made “desolate, and naked . . . her flesh” eaten and completely burned “with fire.” Prior to burning her, the ten kings make “her desolate and naked” suggesting she will be plundered and striped of all her belongings leaving her “naked” and empty handed before her execution. This harmonizes with Daniel’s prophecy where he “beheld then because of the voice of the great words which the horn spake: I beheld even till the beast was slain, and his body destroyed, and given to the burning flame. As concerning the rest of the beasts, they had their dominion taken away: yet their lives were prolonged for a season and time” (Daniel 7:11, 12). Although the Commentary concludes this burning is “figurative” because the “woman” is figurative, ” since “the smoke of her burning” is seen by “the kings of the earth” and others (Revelation 18:9, 18), suggest it is literal. More on that when we get to chapter 18. Verse 17: For God hath put in their hearts to fulfil his will, and to agree, and give their kingdom unto the beast, until the words of God shall be fulfilled. As ghastly as the deeds of the “ten horns” of verse 16 appear, according to this verse, they harmonized with God’s plan to bring judgment to the “great whore” as depicted in verse 1. So, once again we see here the implementation of God’s passive form of punishment. The Commentary suggests: “This sentence will be meted out to Babylon under the seventh plague” depicted in chapter 16:19 where “the great city was divided into three parts, and the cities of the nations fell: and great Babylon came in remembrance before God, to give unto her the cup of the wine of the fierceness of his wrath.” However, note the absence of any fire or fires during that scenario. The only plague that comes close is the “fourth” where “power was given [the sun] to scorch men with fire” (Revelation 16:8, 9), not consume them. If the former interpretation were to be applied, it would be difficult to understand how the “woman” could be burned without engulfing the entire earth. The latter is more definitive. It brings into focus Vatican city, making the burning, without destroying the earth, far more understandable. Many years even before John’s time God said to His prophet: “I will render unto Babylon and to all the inhabitants of Chaldea all their evil that they have done in Zion in your sight, saith the LORD. Behold, I am against thee, O destroying mountain, saith the LORD, which destroyest all the earth: and I will stretch out mine hand upon thee, and roll thee down from the rocks, and will make thee a burnt mountain” (Jeremiah 51: 24, 25). John’s vision appears to echo that prophecy when “the second angel sounded” his trumpet “and as it were a great mountain burning with fire was cast into the sea:” (Revelation 8:8). Here, more details are provided regarding that prophecy . Summary of chapter 17: At first glance, the relationship of this chapter to that of the seven last plagues featured in chapter 16 seems obvious when “one” of the seven plague bearing angels told John he would show him the “judgment of the great whore.” Such is not the case because the angel depicts her fate taking place during the second trumpet episode of Revelation 8:9 rather then 16:19 where “great Babylon [only] came in remembrance” suggesting she had suffered her demise sometime previously. That previous episode took place during the second trumpet event of Revelation 8:8 when that “great mountain burning with fire was cast into the sea.” It also corresponds to Revelation 19:20 when “the beast was taken, and . . . cast alive into a lake of fire . . .” Recall also Daniel’s vision where he heard “the voice of the great words which the horn spake:” he even “beheld even till the beast was slain, and his body destroyed, and given to the burning flame” (Daniel 7:11) which must be the second trumpet scenario of Revelation 8:8,9. She will be called to account for the fact that she is responsible for becoming “drunken with the blood of the saints” as well as for fostering corrupting doctrines and other lies. God will allow ten pagan kings to administer that judgment. Then, the angel told John that the devil, in the form of a seven headed, ten horn dragon, will actually materialize himself and become the eighth pope in line with the previous seven sometime after the woman, representing Vatican city, has suffered its fate. The fate of “the rest of the beasts” (Daniel 7:12) will take place when “”the great river Euphrates . . . was dried up . . . and the great city was divided into three parts” in Revelation 16:12, 19. Although the words “to give” suggest a present application, the word “rembrance” suggests reflection upon something in the past. The word “remembrance” is from Strong’s #3415 mnaomai. KJV – remember 16, be mindful 2, be had in remembrance 1, in remembrance 1, come in remembrance 1; 21. 1) to remind, 1a) to be recalled or to return to one’s mind, to remind one’s self of, to remember, 1b) to be recalled to mind, to be remembered, had in remembrance, 1c) to remember a thing, 1d) be mindful of. the Commentary makes some interesting statements about the relationship of the “scarlet coloured beast” to the “great red dragon” of chapter 12 and the leopardlike beast of chapter 13: “In certain respects this beast [the scarlet coloured beast] resembles the great red dragon of ch.12:3, and in others the leopardlike beast of ch.13:1,2. The context makes the latter relationship appear to be closer.” (SDA Bible Commentary Vol.7, page 851 left column under “Beast.”) In that case, the “great whore” would be seen sitting upon or controlling the papal organization which makes good sense even though “the great red dragon” and the “scarlet coloured beast” are far more similar to my mind. 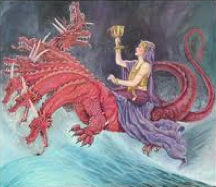 note the subtle change from the “woman” sitting on the “waters” in verse 1 to verse 3 where the woman was noted to be “sitting” on the red “beast.” But, verse 7 notes that the beast was carrying her. Therefore, the “beast” was controlling her, not the other way around! Furthermore, the “beast” was also controlling the “waters” through her in verse 1.
 its true that the three part division spoken of in Rev.16:19 is depicted in context with “the seventh” plague bearing “angel,” but the initiating event that broke it up must have come when “the sixth’ plague bearing “angel poured out his vial “upon the great river Euphrates” in verse 12. 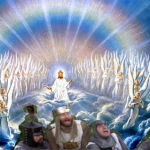 Look it up in Manuscript Releases Vol.20 pages 197, 198 where the bracketed words appear in Mrs. White’s quote of Revelation 6:9-11: “And white robes were given unto every one of them [They were pronounced pure and holy] . . .” This is a pronouncement of judgment . Please understand, I did not supply the bracketed words! This a safe conclusion because the “image” and “mark” of Revelation 13:16, 17 are still future. see Great Controversy page 50. Although Mrs. White was not addressing Revelation 17 in this quote, the concept fits because, as we shall see, the “ten horns” represent ten pagan kings, while the “seven heads” represent seven “apostate Christian” kings. [29a] see 7BC 854 (right column 2nd paragraph) under “Yet is”. [29c] the word “wonder” is from the Greek word “thaumazo” (#2296) the same word translated “marvel” in verse 7 and “wonder” in verse 6! The word “admiration” in verse 6 is from a closely related word “thauma” (#2295). “out of” is from: “ek” (Strong’s #1537) translated “of” 366 times, “out of” 162 times, out of a total of 921 according to the Online Computer Lexicon. Therefore, “of” or “during” seems a valid interpretation, but using “of” or “during” with the metaphoric “bottomless pit” would sound pretty awkward! Nevertheless, even though it sounds better to depict the beast coming “out of” instead of “of” or “during,” the fact that it goes “into perdition” or “utter ruin” supports the post probationary concept. see Revelation 16:10 which I believe to be Jerusalem at the time of the plagues, but Rome prior to the post probationary second trumpet scenario of Rev.8:8.9.
 this is one of the possible interpretations offered in 7BC 855. Also Merle D’Aubigne “History of the Reformation” Book 1, chapter VI page 67; Malachi Martin “The Keys of This Blood” page 627. Nothing is said about it in the Spirit of Prophecy. see SDA Bible Commentary Vol.7, 855 (2nd paragraph right column) ASV: “and they are seven kings;” TCNT: “They are also seven kings;” NIV: “They are also seven kings” Uriah Smith concurs saying: “The seven heads are explained to be, first, seven mountains, and then seven kings.” (DR page 711). many interpretations have been attempted, some of them alluded to in 7BC 855, 856, probably the most popular as “Egypt, Assyria, Babylon, Persia, and Greece, the United States after 1798’ and The Roman Empire in John’s day. The Commentary suggests three possible options: (1) “all powers that oppose God’s people and work on earth” (2) Babylon, Persia, Greece, Rome, and the papacy” (3) “Egypt, Assyria, Babylon, Persia, and Greece” (SDA Bible Commentary Vol.7, page 855, 856 (under “Five are fallen.”) But, since it is generally agreed that the “seven mountain” represent Rome, we must also agree that Egypt, Babylon, Greece and Persia never sat in Rome! So, how could they be represented here? But, consider the description of the sea beast in Rev.13:2 that is ” like…a leopard (Greece), has “the feet of a bear (Medo Persia), and “the mouth of a lion” (Babylon)” giving the forgoing suggestion some leverage. However, that ascription omits Egypt which weakens the similarity. Up until the death of pope John Paul II, I, among others thought the starting point could be the Lateran Treaty of 1929 with five popes “Pius XI, Pius XII, John XXIII, Paul VI and John Paul I being the “five.” That would make John Paul II the “one that is.” The interpretation fell flat, as far as I am concerned when John Paul II died in April of 2,005. If that is the correct interpretation, the “short space” for the present pope would have to be less than two years (now five) and counting, by now! At the time of this revision, pope Benedict XVI resigned February 2013 after reigning almost 8 years and is now followed by pope Franciscus. Will he be the “short space” pope? Only time will tell. Some, even of the Catholic faith, believe he will be the “last pope.” This, of course, holds in question that the “five” who are fallen, begins in 1929 when the Lateran treaty was signed. The present pope Benedict XVI was elected 19 April 2005, making him the seventh since 1929. But, if it were him, the “short space” mentioned in Revelation 17:10 will have to be lengthened more than four (now 5) years at the time of this writing. Although the “short space” could be longer than we might think, four years seems far to long! Only with a retrospective approach, looking back after several other details have been filled in, perhaps with the “fifth seal” test and even the beginnings of the trumpet episodes after the close of probation, can we be certain. “. . . it may be innocent to speculate beyond what God’s word has revealed, if our theories do not contradict facts found in the Scriptures:” (Patriarchs and Prophets page 113) Although scientific theory is the subject addressed there, it surely applies to prophecy as well. Manuscript Releases Vol.19, page 242 (brackets not supplied, italics & underlining supplied) This quote consists of two paragraphs, but I brought them together to emphasize the last day setting of Revelation 17:13, 14. There are several other quotes saying basically the same thing. For example; Review and Herald 1-13-13; 11-29-92; 9-7-96 (A couple of those imply the “great multitude” featured in Revelation 7:9, 10). See also 1888 Materials page 1075; also Manuscript Releases Vol. 8 page 344, and Vol. 1, page 297. [58a] see The Great Controversy page 342 paraphrased. that is if “hour” is interpreted on the basis of prophetic “day-for-a-year” time as noted in the Commentary page 856 (bottom right column); or even more brief if it is considered literal. While prophetic time does not apply to any future prophecies, as we have learned, even if the “one hour” represents “two weeks,” any historic application is most unlikely. SDA Bible Commentary Vol.7, 858 (bottom right column under “17. God hath put.”) In the Greek, the words “hath put” are from “didomi.” It is translated “give” 365 times, “grant” 10 times, “put” five times, “show” four times, “deliver” twice, “make” twice, and misc. 25. Therefore, “allowing” or “allowed” corresponds with the frequently translated “give” or “grant” quite well.